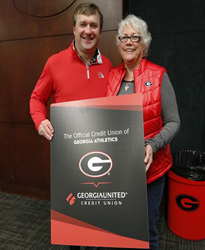 The Kirby Smart endorsement is part of Georgia United’s five-year expanded partnership as the Official Credit Union of Georgia Athletics. University of Georgia’s Head Coach, Kirby Smart, is pictured with Georgia United President and CEO, Debbie Smith. Coach Kirby Smart stated, "Teamwork is a powerful dynamic in football and life. My friends at Georgia United Credit Union have had a winning, unified team for over 60 years and we’re excited to be a part of it." On August 13, 2018, Georgia United Credit Union released their commercial starring the University of Georgia’s Head Coach, Kirby Smart. The commercial is scheduled to run over the next several weeks on various cable networks and streaming devices. The first commercial, “Tradition”, can be viewed on Georgia United’s website at gucu.org/uga. The Smart endorsement is part of Georgia United’s five-year expanded partnership as the Official Credit Union of Georgia Athletics that began in 2015. The partnership will further strengthen the credit union’s presence on campus and at Georgia football games with in-venue signage, in-game features, a gymnastic entitlement meet, radio commercials and future television and digital segments. Georgia United Credit Union is a proud partner of the University of Georgia and serves the Clark, Oconee and surrounding counties. Headquartered in Duluth, GA, Georgia United is ranked as one of the top credit unions in Georgia, with 1.3+ billion in assets, over 160,000 members, 19 local branches and access to over 5,000 shared-branch locations. As a member-owned financial institution, they offer competitive products and services for all ages with higher returns, reduced fees and lower loan rates. Visit gucu.org to learn more and follow the credit union on Facebook at facebook.com/GeorgiaUnitedCU, Twitter @GAUnitedCU and Instagram @gucucares.